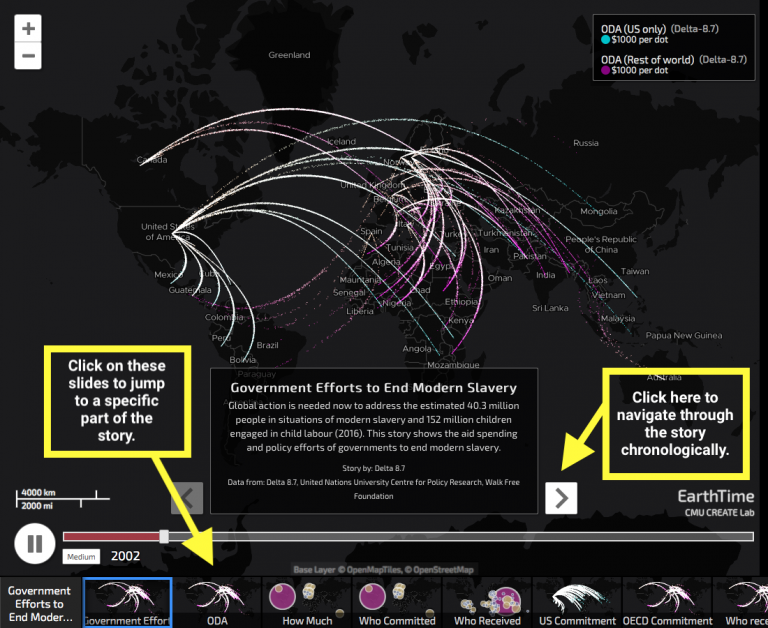 These stories also compliment the Data Dashboards, which visualize available data on forced labour, modern slavery, human trafficking and child labour on the national level. Users can interact with the story either by clicking on the right and left arrows on the sides of the text box or clicking on the slides at the bottom of the frame to jump to a specific story slide. Users can zoom in or out of each waypoint to isolate specific regions or countries of the world by using the “+/-” on the upper left corner or scrolling up or down on the mouse. To return to the story, simply click “Resume story” and the story will continue from the last-visualized slide. Should there be a delay in visualizing a specific layer or the spinning wheel appears, users should allow for the layer to load or they can refresh the page. To view this story on EarthTime or on mobile, click here.